Superstar Salman Khan has been convicted again for killing a black buck while on location in Rajasthan 20 years ago, many say thanks only to the sustained pressure from the animal loving Bishnoi community, But as all his earlier convictions for killing chinkaras and black bucks have been overturned by higher courts, this latest one may go the same way. Last week, animal lovers were shocked to learn that giraffes are now an endangered species in Africa. Thanks to indiscriminate hunting by so-called trophy-seekers–mostly Americans with too much money and high powered guns—this genteel creature is now well on the road to extinction. But will we humans feel ashamed of ourselves? Africa has often been praised for its “management” of its wildlife, allowing big game hunters in for licenced shooting of magnificent animals such as lions, giraffes and elephants, and scores of other “lesser” wild creatures. The justification is to keep numbers in check, but this in fact only feeds the exclusively human to urge to kill for sport. Even Salman Khan was perhaps prompted by this urge—and its supposed manly connotations—to kill various Indian antelopes for an audience of admiring co-stars, aided by conniving local facilitators. Sadly, he is not the only one to have done so, just the most famous one to ever get caught. Actual punitive action is another matter altogether. 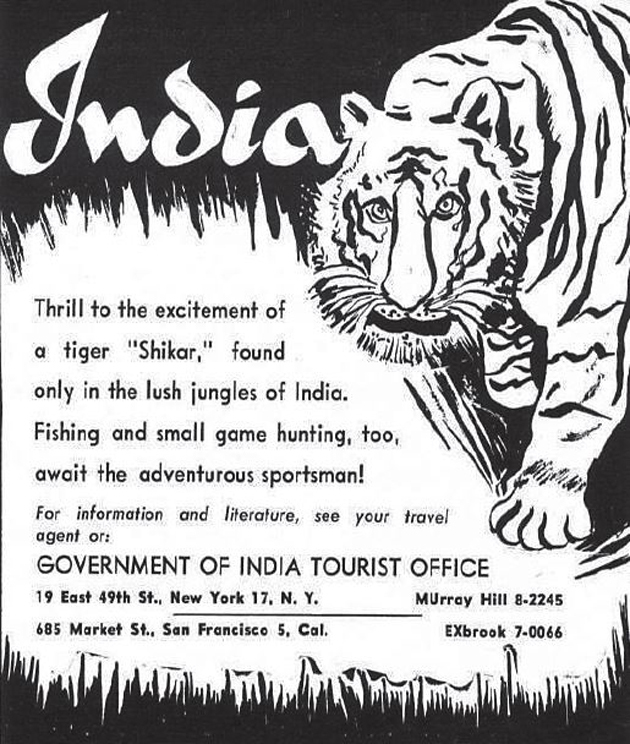 Recently a friend tweeted a 1950s advertisement in the US by the Government of India Tourist Office, inviting Americans for ‘shikar’ trips to India with a tiger prominently displayed. “Fishing and small game hunting” was also included in the ad. The authorities back then clearly thought that our wildlife population should be commercially exploited. When Queen Elizabeth and Prince Philip came on their first state visit to India in 1961, they went on a tiger shoot with their Jaipur royal pals–Sawai Man Singh II and Maharani Gayatri Devi— and happily posed with their dead “trophy”. Incidentally, her grandfather King George V had shot no less than 39 tigers and 4 bears when he visited Nepal in 1911. Jawaharlal Nehru famously rejected Queen Elizabeth’s request for a live calf to be used as bait (as recounted in the Rashtrapati Bhavan publication Abode Under the Dome) but he did not veto the hunt. In fact, hunting tigers was only banned a decade later in 1971 although an estimated 80,000 of them were killed from 1875–1925 and probably more till 1971. Killing a calf was deemed more morally (and possibly, politically) reprehensible than shooting tigers for sport, even by a statesman as perspicacious as Nehru. Ironically, Prince Philip –who fired the “kill shot” in Ranthambore— became president of the British National Appeal, the first national body in the World Wildlife Fund family, also in 1961. While the tiger population is inching up now thanks to conservation efforts in India after 1971, they will never be truly safe from extinction. Already tiger populations elsewhere in Asia are declining alarmingly. The situation of the Asiatic lion is even worse as Gir in western India is literally their last stand—less than 600 exist of this once prolific species. Chinkaras and black buck are diminishing in number due to reduced wilderness and a billion-plus Indians’ insatiable need for space to live and grow food. They are in the same boat as tigers, lions, elephants, rhinos, bears, leopards and a host of other quadruped and feathered Indians. But it cannot be denied that in order to live, we Indians need to let live too.